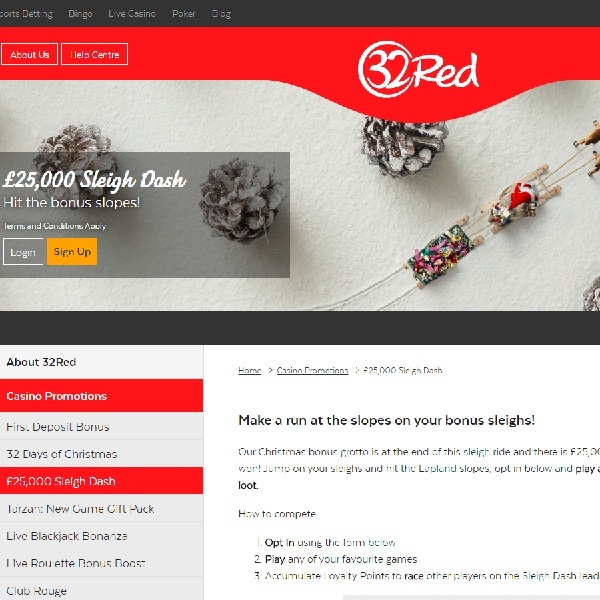 32Red Casino has launched a £25,000 sleigh ride giving you the chance to win some fantastic casino bonuses. All you have to do is opt in to the promotion and start playing your favourite games. You will then accumulate Loyalty Points which will determine your position on the leaderboard. The promotion is running until December 22nd so there is still plenty of time to collect points and make sure that you claim one of the bonuses. There will be 125 winners in the promotion with a huge top prize of £5,000. Second prize is £3,000, third is £2,000 and fourth is £1,000. The other winners will receive prizes ranging from £25 right up to £750. Start playing at 32Red today to make sure that you collect plenty of points and receive a fantastic bonus in time for Christmas.